Salt & Pepper are the condiment kings; the only rock we eat and the only spice to be found both in the Chef's kitchen and with the Front of House on the restaurant table. To cater for the spicier and salt of the earth Chefs - we offer larger 500g and 1kg tubs of Salthouse & Peppermongers exclusively for trade. For more information and pricing please contact us here on our Trade page, putting “FOODSERVICE” at the top of the message. Introducing Salthouse & Peppermongers CrushGrind inverted mills. - Save hours refilling tricky mills. - Save money replacing broken mills. - Save mess on the table with inverted mills. 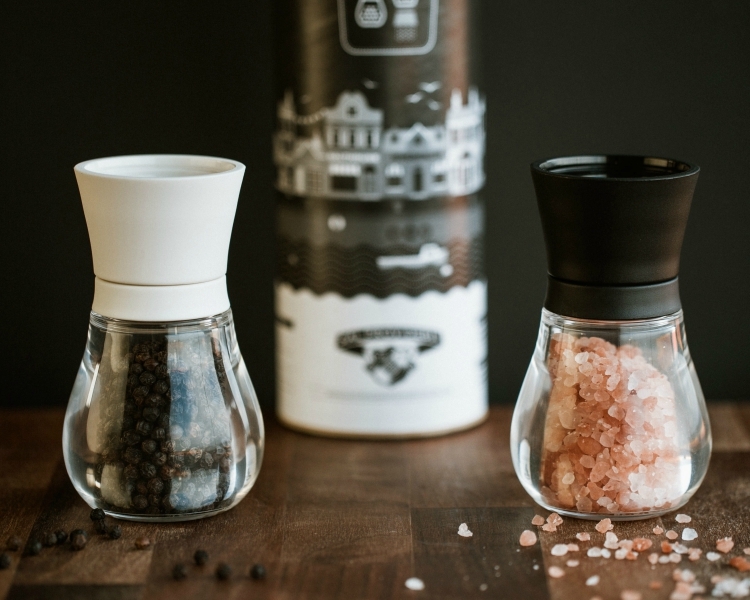 The Salthouse & Peppermongers Mills are the newest addition to our range, essential in professional kitchens and on customer tables across the land. Our state of the art ‘CrushGrind®’ mills produce a high-quality grind and contain Salthouse & Peppermongers very own Himalayan Pink Rock Salt and Tellicherry (TGSEB) Black Pepper. - The robust and long-lasting ceramic ‘CrushGrind®’ mechanism ensures only salt & pepper is added to your dish. - Suitable for everyday use in the harshest of kitchens. - The inverted design reduces mess in the kitchen or at the table. - Ensures that the product is both crushed and ground to release both aroma and flavour or maximum impact. - Comes with a 5 year guarantee on the ceramic parts of the grinder.